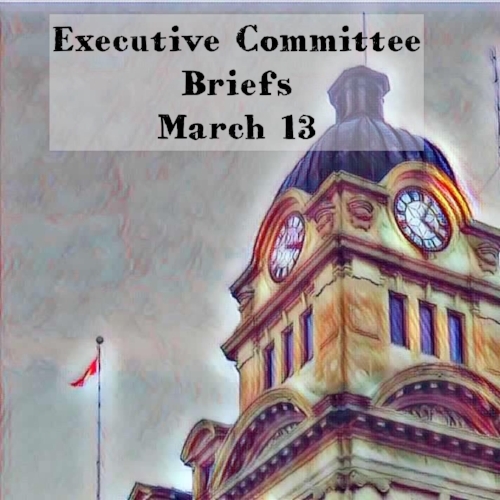 Council's Executive Committee received reports from citizen advisory committees plus a request by a well known charity for waving landfill fees. Margaret Moran, Wakamow Valley Authority CEO spoke to the committee about the need for roof repairs at the Connor Pavilion. The cedar shake roof needs replacement. The Connor Pavilion is the former Jitney Dance Hall. The committee heard an update about the neon sign on the former Moose Jaw Times-Herald building. The committee was told the building's leasee had no plans of taking down the sign. Contact information on the building's owner was provided to the committee. The Committee received confirmation they will be able to carry over unspent funds from the 2017 budget. The funds total $402.08. The Committee approved funding dispersals from Saskatchewan Lotteries. The funds are given to the city as part of the sale of lottery tickets purchased from the Western Canada Lottery Corporation. A total of $132,431 was dispersed. As part of the funding criteria 30 per cent of the funding allocation had to go to targeted groups - seniors, indigenous people, persons with disabilities, women, single parent families etc. Not all groups applying for funding were eligible. The committee looked at the new draft traffic bylaw presently being updated for input. One thing looked at in this review was recommending bicycle helmets not be mandatory for everyone but instead to change the language and make bicycle helmets mandatory only for riders under 18. The measure passed with only Councilors Dawn Luhning and Brian Swanson opposed. Also recommended was exempting recreational vehicles from oversized vehicles parking rules in the new bylaw. Additionally RVs would only be allowed to park for 48 hours instead of the 72 hours allowed now. The proposed bylaw will now be open for additional public input before receiving readings and being enacted at a later Council meeting. The draft Traffic Bylaw was tabled until a future Executive Committee meeting to allow for public consultation. The committee discussed a potential new 4 Way Stop or overhead flashing light at the intersection of Athabasca Street East and 6th Avenue NE. The Salvation Army made a request to have the City wave landfill fees. The Salvation Army is asking for a $2000 exemption for people dumping unreusable items, such as mattresses, that residents do not want to take to the landfill themselves, Council was told. Council was also told the Salvation Army spends $2500 annually for labour and other related expenses trucking to the landfill. In a report recommending waving the fee to Executive Committee, the committee was told the request would favour one group over another and a policy needed to be developed. "It (the request) would create an unequal level of service with respect to other religious institutions, not for profits organizations and charities," the report stated before recommending approval and advising Council to develop a policy. The Salvation Army's request was tabled to look into alternatives to hauling, what is mainly mattresses, to the landfill.